20/7/08 — Acquisition — Nogent-sur-Seine, Musee Paul Dubois – Alfred Bouche r — Camille Claudel’s grand marble sculpture (ill.), acquired by the museum in Nogent-sur-Seine thanks to the concerted effort of several patrons , is now on display for the general public. Camille Claudel lived in Nogent-sur-Seine from 1876 to 1879 during which time she was a student of Alfred Boucher. It was only in 1882, after moving to Paris where she continued to follow her teacher’s advice, that he recommended her to Rodin since he was leaving for Florence. The museum in Nogent-sur-Seine was created in 1902 on Alfred Boucher’s initiative and proceeded to assemble a collection of 19th century sculptures which today holds about 400 pieces. Among other items, it includes works by Boucher and Paul Dubois, as well as by Henri Chapu, Jules Dalou, Alexandre Falguière and Rodin. Camille Claudel was already represented by two bronzes edited by Eugène Blot : a study of the Head of Hamadryad and a small replica of the Imploring Woman. 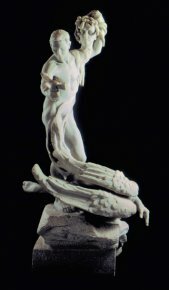 The group of Perseus and the Gorgon was conceived in 1897 and the plaster cast, alas destroyed by the artist in 1912, was presented in 1899 at the Salon de la Société Nationale des Beaux-Arts. Although Camille Claudel was trained in direct carving by Boucher, the transcription into marble, corresponding to a commission from the Countess Arthur de Maigret, was entrusted to Francois Pompon. The completed work  was in turn exhibited at the Salon de la Société Nationale des Beaux-Arts in 1902 before being installed permanently at the foot of the staircase in the Maigret’s Parisian home at 22, rue de Teheran. In 1983 it appeared on the art market and was finally acquired by the AGF insurance company in 1989. The museum purchased it directly from them[[Let us point out that AGF accepted a lower price than that which it had paid originally for it in 1989, despite the significant increase in the value of the artist’s works.]. In terms of style, the work recalls Florentine Renaissance models. Many sculptors from the second half of the 19th century sought inspiration in Cinquecento Italian art, among them in fact, Boucher and especially Paul Dubois who is known for the famous Florentine Singer. All the more reason for this museum whose name they commemorate to make the acquisition. N.B. The text of this news item is largely based on information graciously provided by the museum’s curator, Jacques Piette. The acquisition was made possible due to the participation of seventeen patrons : E.D.F., CRCA Crédit Agricole Champagne Bourgogne, SAIPOL, Centre commercial Belle Idée, Société POK, SAS Agri Condiments, Groupe Soufflet, Société Gaget, SARL ANAU, Cabinet Lenoir et associés, SIABA, Larbalettier SASSU, ACMM, La Renaissance, Société Emin-Leydier, Cabinet Prieur, L’Etat (fonds du Patrimoine) with régional institutions (Conseil Régional de Champagne Ardenne, Conseil Général de l’Aube) and the city of Nogent-sur-Seine) also contributing. Finally, a public fundraising campaign was also held by the association “Camille Claudel à Nogent-sur-Seine”. The statue has lost the shield with which Perseus petrified the Gorgon by using its reflection.